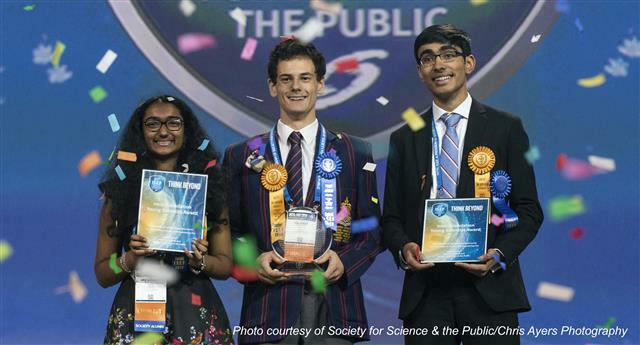 Congratulations to Henry M. Jackson High School senior Dhruvik Parikh, recipient of the Intel Foundation Young Scientist Award. Dhruvik is very active in his school and community. He is involved in Science Research Club, Technology Student Association, Math Honor Society, National Honor Society and a member of the boys tennis team. In addition, he is an Everett School District student representative on its School Board, serving a two-year term from 2016 through 2018. Dhruvik first started with the district’s virtual learning program OnlineHS, while in his 8th-grade year at Gateway Middle School. He completed a year of high school Algebra II/Trigonometry online. OnlineHS Math teacher Mark Ryder remembers Dhruvik as a student who worked hard, was impressive in his ability to work independently and maturely advocate for himself. Dhruvik has a passion to make STEM education a priority and wants to help every student, regardless of their challenges, graduate from high school. He believes this work is done by helping every student feel connected to the administration and school community.